Brown is situated at the farthest end of the backstretch, around the back edge of the training oval. From the front, it looks like the other Belmont barns, but when you step out the back door to the bath mats, it's easy to forget you're at a racetrack. The spacious backyard of Brown's barn is shaded by trees and divided into pens, coops, and nesting boxes. Goats bounce on piles of hay, chickens wander by, and several dozen ducks and ducklings are tucked into sheltered areas out of the sun. A miniature horse is bucking in her pen, and a pig lazily observes the Thoroughbreds' baths from the shade. Brown is, by all accounts, an animal lover. When a pet is abandoned on the backstretch, he gives it a home until it finds a new place to live. Some of them, like Boe Boe, the pig watching the morning baths, have special needs. Boe Boe's back legs are paralyzed, so he can't move fast or far. Others were left homeless when their trainers went out of business. Marrone, a lifelong racetracker, is one of the main caretakers of the petting zoo. She knows what each creature needs, and who's best buddies with who. She even knows the family tree of Poncho, the goat Finch adopted to be a companion for her elderly horse. The mix of animals has changed through the years. According to a profile on America's Best Racing, the petting zoo once had as many as 50 chickens, but ducks are the big thing now. One duck turned out to have 14 ducklings, which everyone agreed seems like some sort of record, and it has brought the duck number to 32. “Nobody wants ducks because they're just sort of messy and noisy. We don't mind them here. Do we need 32? No,” Marrone laughed. “I have 32 ducks, we have 34 horses, it's almost a duck for every horse. Marrone tries to find new homes for the animals. Chickens are popular because of their ability to provide fresh eggs, and goats make for good companions to horses. She had a much larger number of rabbits at one point but is down to just a handful now. Now and then, Marrone adds new species to the zoo. Just a few days before my visit, two turtles appeared in the pool she had left out for ducks. She suspects, based on their appearance, they had some help finding her. 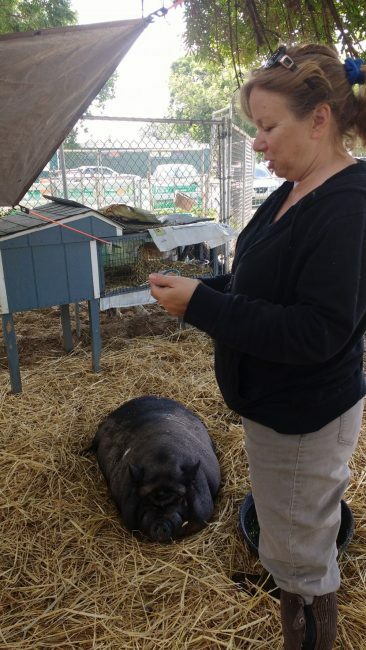 Belmont Park officials are aware of the Brown petting zoo and even called Marrone some time ago when they found a guinea pig abandoned in a box in one of the track's parking lots. 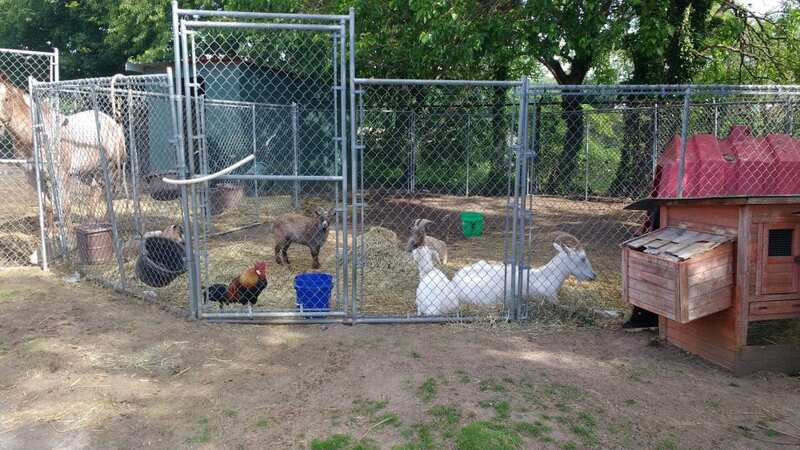 Possibly the most amazing thing about the petting zoo: Marrone said she's never been given an animal that didn't find its place in the social dynamics of the others. Roosters can get a little territorial, so she tries to limit the number of them on the property, but otherwise, Thoroughbreds, pigs, cats, chickens, rabbits – everyone is in the picture of harmony. Chickens sit on Boe Boe's back because he's warm, and Roxy the mini-horse cuddles with the barn's other pig back in her stall. Marrone thinks the activity is soothing to Thoroughbreds and sets them up well for a life away from the track, where they might meet any one of these species in a barn or on a trail ride. For Marrone, that contentment makes her day more pleasant, too. Do you know a Barn Buddy we should profile? Email [email protected] All species welcome. 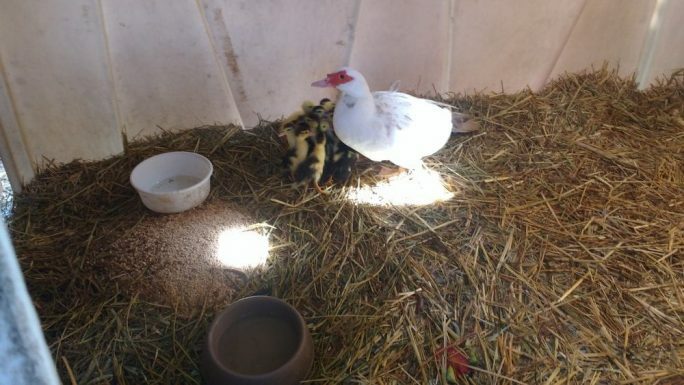 This entry was posted in Barn Buddies, Horse Care, NL Article and tagged barn buddies, belmont park, Bruce Brown, ducklings, ducks, maria marrone by Natalie Voss. Bookmark the permalink.